If you know me from Facebook, you're aware that I've spent the last week or so changing my cover photo and my profile pictures. While it probably seems like a frivolous use of time, I actually did it in lieu of any kind of post on many days. The pictures were all taken over the past 8 years at the resort we go to every year. Each time I posted a picture it brought back fond memories of good times at Pine Forest Lodge in Mercer, WI. Some were kid pictures, some teen, and some adults. All of them however, have smiles in them. When we ask our kids about what their "favorite vacation ever" was, they have different responses, South Dakota, Colorado, etc. But when we ask them what are some of their favorite memories of a vacation, they always go back to "the cabin with our cousins." It seems there's a timelessness to all summer vacations "at the lake," and I'm sure this is true for many, many families all over the country. It's a Midwest thing that has gone on for generations, getting away from it all in the woods of the great north. I can remember a weekend when we were just little kids and my mom was dating a man who took us up to his cabin in Hibbing, Minnesota. 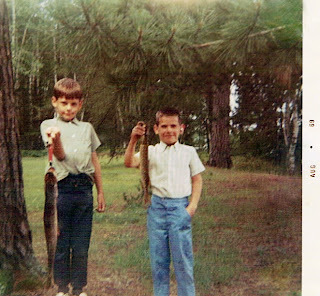 We had a blast as a family and it was where I remember catching my first really big fish. One of the more classic pictures of it is below. It was a thrill then and represents one of my earliest cabin memories. Over the years, Mom always saw to it that we got up to a cabin every year. At first it was Morningside Resort in north central Minnesota. This resort was the site of numerous family gatherings over the years. The lake never produced much in the way of fish, as I recall. I remember fishing with my sister's father in law Johnny, and after trying corner after corner of the lake he said, "There ain't no fish in this lake, Jim." I think he was on to something. We switched to a newer, better maintained resort after the owners of Morningside let the place slide too much and we looked for a change. We ended up getting a place in Hackensack, MN. (Who needs a house out in Hackensack? Is that all you get for your money?) It was a nice place but the beach access was a drag and the owner was less than accomodating. After 3 years there we found Pine Forest Lodge and have been there ever since. It is my Minnesota family's home away from home for a week every year. We drive up from Waukesha and they drive from the Twin Cities. It's an even 5 hour ride for all of us, so no one gets stuck driving more than anyone else. One of the the owners (John) used to work with my wife at the Southeastern Wisconsin Center for Independent Living in Milwaukee. He and his wife are wonderful hosts and we consider them part of the family while we're there. I remember John once saying that it gave him great joy to see families coming together every summer and just having a blast. That is part of the reason he and Sherri bought the resort in the first place. The week (or weekend) consists of a lot of fishing, swimming, reading and cousins running between cabins to see what the others are up to. Fish are caught and released, old stories recounted and embellished, junk food consumed and everyone moves to their own schedule. At night campfire discussions rise and fall with the flames and there is always an air of fun to the conversation. If you want to talk politics or religion, don't do it there. If you want to talk about the time someone fell off the dock, well, bring it! The beauty of the cabin is everyone's open door policy. Feel free to stop by and chat with whoever you'd like, whenever you'd like. It allows family to talk below the surface and find out how everyone is really doing, what they're really going through. Given the circumstances of almost two years ago, we all understand the importance of time together. No one takes the cabin for granted anymore, a legacy my brother left with all of us. I cherish the time I get to spend in the boat fishing with my brothers Paul and Tom, the "coffee time" with mom in the mornings, the beach time with my sisters Pat and Jane and the "outlaws" Patty , Jane TL, and Deb. I look forward to throwing nieces and nephews off the life raft as we play "trivial pursuit" and they guess the wrong answer. And now, with the latest trend of having friends come up, I enjoy their company at meal times, fishing with my buddy Steve, and laughing around the beach area and campfire. Pine Forest Lodge is a refuge for me, for my family and my friends. It's one place I hope will never change. Like my kids, after the "big" vacations, my first thought of "best memories" comes from the cabin at Pine Forest Lodge and all the others. If you haven't tried it as a family, you might best start now, because time's a wastin'. Yes, my brother Rob was hearing impaired his whole life. That's an "old school" hearing aid.